In 2014, I suggested that 2015 would be an inflection point due to the start of serious 5G activity and the start of cloud based deployments , which together had the potential to fundamentally change the telecom industry. So what really happened and what’s up for 2016? 5G did of course progress throughout the year, but perhaps the biggest news came in September. At the CTIA event, Verizon threw down the gauntlet (as did Nokia), and challenged the industry to deliver pre-standard solutions in 2017 just ahead of Korea’s 2018 Olympics and Japan’s 2020 Olympics. With that, we now have the big three (USA, Korea, Japan) having established lines in the sand. The 3GPP R13 meeting held in September also kicked off discussions on 5G with a preliminary view of timelines and study items, which was followed by the WRC15 meeting in November that looked at cmWave and mmWave candidates for WRC19. With those, we can say 5G work has started, formally. And how about commercial cloud deployments? It’s true they did start in 2015; however, this was typically for single network functions like new EPC or IMS installations. What’s coming in 2016 and 2017 will be more of the same, but with the result being multi-function cloud networks; and that’s really where the long sought after agility, OPEX and CAPEX gains will start to come. The reason is that clouds don’t really bring substantive change without scale. However, even with these early steps, the change to a horizontal purchasing model has started, where operators buy hardware, stacks, and VNFs, independently. That’s big. Time will tell if these predicted inflection points will result in truly fundamental change going forward, but I do think so. Looking forward into 2016, we can see these two big guns continuing, two new ones starting, and a few long tails. These will be very interesting developments indeed. Regarding 5G, with 3GPP work started, and lines in the sand established, the race is now on to develop pre-standard systems that can be applied to limited use cases. Proof of Concept systems that exist today will evolve, mature, and begin early field trials in 2016. The challenges are immense. Chipsets, CPEs, antennas, wireless backhaul, frequency selection, propagation and penetration considerations, are just a small list of hurdles ahead. All of this will happen in parallel to standards being developed. It’s a race, and an ultra-marathon one at that. Cloud computing will continue to progress towards the new normal by 2017, and there are parts that are predictable and parts that are still being defined. With the realization of increasingly dense, complex, and stringent transport requirements, there’s an invigorating discussion underway between several large operators and vendors on how to best use SDN, and employ strict control / user plane separation to both simplify and automate transport connectivity. We expect some large architectural changes to come out of those discussions, with baby steps showing up in 2016. Are there any new big guns? Yes. The Internet of Things (IoT) is a wonderful buzzword that encapsulates more or less everything, and for that reason is hard to get a grip on at times. More practically though, in the wireless 3GPP world, it has come down to a single standard that is hotly debated, referred to as narrowband IoT, or NB-IoT, a 200KHz solution. It has LTE and clean slate alternatives being considered, with closure on the UL/DL selections expected at the next R13 RAN meeting in December. There is also a wider band LTE-M solution with a 1.4MHz carrier. Together, they could be loosely called high and low end solutions for cellular IoT. They will provide a foundation for the development of low cost chipsets that will enable the cellular industry to better compete with the dominant, lower cost, somewhat proprietary systems that exist today. It’s what many have been waiting for. That’s a big gun. Finally, 3.5GHz. It’s hard to imagine how a frequency used by the U.S. Department of Defense could impact all of telecom, maybe forever - but it will. With the FCC’s announcement of the spectrum sharing rules for 3.5GHz, a paradigm has been set that may be applied to all future auctions. It’s a grand experiment with one of far reaching consequences. The associated WINN Forum also recently produced a technical report on the SAS to user (AP) interface. Combined, these set the stage for a new way of using spectrum that includes a general access option, permitting new operators to enter the telecom market in a cost effective way. In short, the 3.5GHz rules both change how spectrum is used and who can use it. It’s most certainly a big gun in the U.S., and one that could spill into other global regulatory regions. We expect products to start showing up in 2016. So four big guns. And now for the long tails. In this case, I use the term to mean increments on top of larger bases, but this by no means implies they will be small or unprofitable, in fact, quite the opposite. Virtual RAN is the first, and we refer to it as our Radio Cloud Architecture. As we virtualize the core, the obvious next step has always been to virtualize the radio access network. While more challenging due to real-time processing demands and latency constraints, it is doable and will happen. Through most of 2015, vendors investigated the best architectural solutions to implement practical virtual RAN solutions. For Nokia, that phase has completed and we are now firmly on a path of execution. Proof of Concept systems that have been around since 2014 will now evolve towards commercial systems in 2016. Note the timing. If we imagine that Radio Cloud systems start in 2016, and the first 5G systems shortly thereafter, would it not make sense to combine the two? Or putting it another way, will all 5G RANs be virtualized? Excellent question and one we are all actively considering. As for other long tails, a couple of other technologies have silently been worked over the last couple of years that will start to see their pay days in 2016. First, LTE-U (or LAA) and LWA, which are, put simply, the coupling of LTE and unlicensed spectrum to provide a better user experience. Also hotly debated due to perceived impacts to the Wi-Fi industry, products will come to fruition in 2016. The impact to users will be gains in terms of downlink throughput, and to operators the ability to take advantage of the large 2.4GHz and 5GHz free spectrum blocks. That in turn may be one tool of many to help support new data offers, like unlimited streaming of content that looks like it has just landed in the U.S. But we shouldn’t limit this long tail to just LTE coupling to Wi-Fi. Multiple Service Operators (MSOs) such as cable operators also have an interest in offering unlicensed voice and data solutions. With improvements in VoWi-Fi and authentication simplifications that come from HotSpot 2.0, MSO infringement into telecom territory will continue. Secondly, how about those Small Cells? There’s been talk for years about adding tens of thousands of Small Cells to existing macro networks, but never really happened to the levels expected. That may be about to change in 2016. The reason is that products are getting better (with things like dual-band, Carrier Aggregation and LTE-U being the norm now), and more attention is being been put on the total solution. With a greater focus on permitting, wireless backhaul, different power levels, pole heights, and fiber and power access, once prohibitive cost levels are starting to drop. In addition, there’s a growing recognition that Small Cells are a highly effective and complementary part of one’s toolkit for designing networks from the start, and not only as an after-thought. It’s hard to say if we are at a global tipping point yet, but certainly, we envision a huge upswing in 2016 for both outdoor and indoor systems. With four big guns and three long tails, 2016 will prove to be a very interesting time indeed for the industry, where new technologies will start to dominate the historically somewhat flat and predictable patterns of the past. Whenever there is change and disruption, there are winners and losers, on both the vendor and operator sides. With the mergers and acquisitions and partnering setups we’ve seen over the last few months, it’s clear that everyone is getting ready for the war by getting access to the right weapons. Who will win and who will lose may not be fully determined in 2016, but big guns and long tails are things to watch. Michael Murphy is CTO for North America, Nokia Networks. 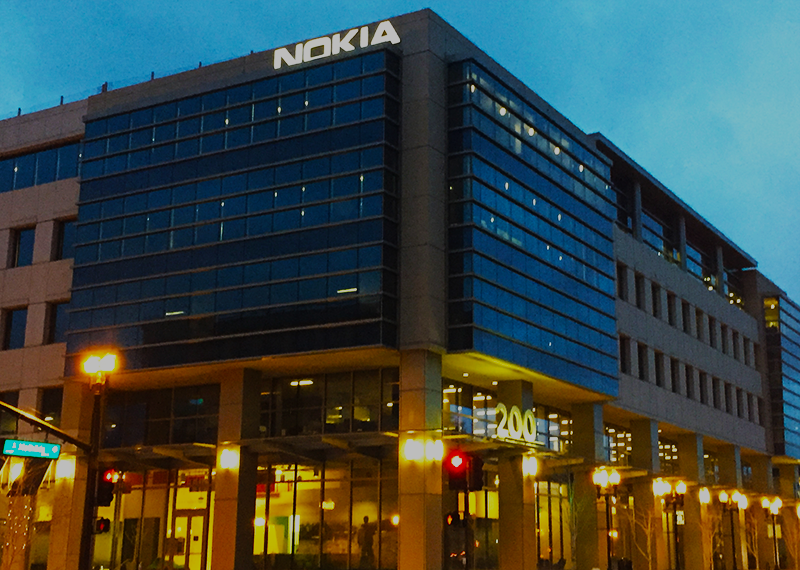 Prior to joining Nokia, Mike was the former head of WCDMA development for Nortel Networks. He has a master’s degree in Mathematics from the University of Waterloo in Canada. He has lived in Turkey, China, Korea, France, Canada, Japan, Thailand, and is now based in Irving, Texas. Ericsson agreed to acquire FYI Television, which provides entertainment metadata and rich media content to broadcasters. Financial terms were not disclosed. FYI Television, which is based in Grand Prairie, Texas, accumulates and distributes TV entertainment content and linear scheduling data from over 9,000 TV networks daily, aggregating the information into customized formats for various digital, media, content, analytics and print clients for use on their connected devices such as tablets, phones, desktops, internet portals and gaming consoles. 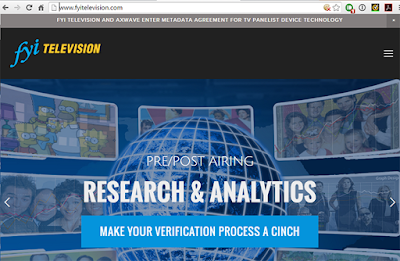 FYI's databases contains more than 2.8 million cast and crew related entities, 1.5 million images directly relating to specific program titles, celebrities and stations, including logos, seasonal key art, movie posters and iconic stills. "As the TV industry evolves and viewing behavior changes, we believe that high-quality, rich metadata will be a key component for a personalized TV experience. Combined with our capabilities in TV platforms and content discovery, we will be able to help our customers to improve the video experience and identify new revenue opportunities. FYI Television's expertise and customer base in the US is a great complementary fit for Ericsson and will be an integral part of our growth strategy. It will strengthen our position as one of the leading providers of media services in the world," stated Magnus Mandersson, Executive Vice President and Head of Business Unit Global Services at Ericsson. Ericsson noted that it is already the largest provider of content discovery services in Europe, delivering metadata, images, search and recommendations on more than 3,000 TV channels in over 30 languages. Every year, Ericsson Broadcast and Media Services distributes more than 2.7 million hours of programming in more than 90 languages for more than 500 TV channels worldwide. In addition, we provide more than 200,000 hours of captioning each year - 80,000 hours of which is live. Ericsson recently established a US broadcast and media services hub based in Atlanta, Georgia. The company currently provides closed captioning services to broadcasters around the world from this hub, with plans to roll out video description services over the coming months. Telstra has validated Infinera's Advanced Coherent Toolkit (ACT) for super-channels. This new technology will cover the Telstra Endeavour subsea cable stretching 9,000 kilometers between Sydney, Australia and Oahu, Hawaii and extract the maximum capacity from subsea and long haul terrestrial cable systems carrying super-channels -- whether for new large area fibers or existing cables. In trials on a range of next-generation super-channel coherent modulation technologies conducted late last year, two unique super-channel based capabilities were successfully demonstrated in the trial -- Nyquist subcarriers and Soft Decision Forward Error Correction (SD-FEC) gain sharing. Infinera said the trial validated the benefit of Nyquist subcarriers that have been shown in other studies to offer around a 20 percent increase in reach compared to single carrier transmission. In addition, the trial validated SD-FEC gain sharing in which carriers with the highest performance can be paired with carriers with lower Optical Signal to Noise Ratio (OSNR) to improve performance. Other capabilities demonstrated as part of this trial include a new Matrix Enhanced Phase Shift Keying (ME-PSK) modulation technique that handily surpasses Binary Phase Shift Key (BPSK) reach performance; and the new, high-gain SD-FEC algorithm. "The comprehensive modulation and compensation techniques in our Advanced Coherent Toolkit enable individual carriers and subcarriers in the super-channel to maximize the overall reach and capacity of the customer's fiber," said Scott Jackson, VP of Infinera's Subsea Business Group. "For example, leveraging these techniques allows cables that previously could only support BPSK to move to higher modulation formats in the future, or support a mix of formats across carriers and subcarriers, for increased fiber capacity and a better return on the asset. This next generation of coherent technology has the potential to dramatically extend the useful life for existing cable systems while also improving the performance of new cables." PCCW Global, the international operating division of Hong Kong's HKT, plans to deliver transatlantic capacity on Aqua Comms’ America Europe Connect (AEConnect) subsea fiber optic cable system, which will enable PCCW Global to obtain additional route diversity. The AlohaNAP data center in Kapolei, Hawaii is now offering Level 3 IP and Fiber Services as well as their Cloud Connect service to securely connect their data center infrastructure to over 30 global cloud services, including Amazon Web Services (AWS), Microsoft Azure, and Google Cloud Platform, with faster speeds and greater reliability. "Level 3 Cloud Connect Platform allows AlohaNAP to provide our enterprise customers a secure private connection to the leading cloud providers in the world," states Robert DeVita, Chief Sales Officer at AlohaNAP. 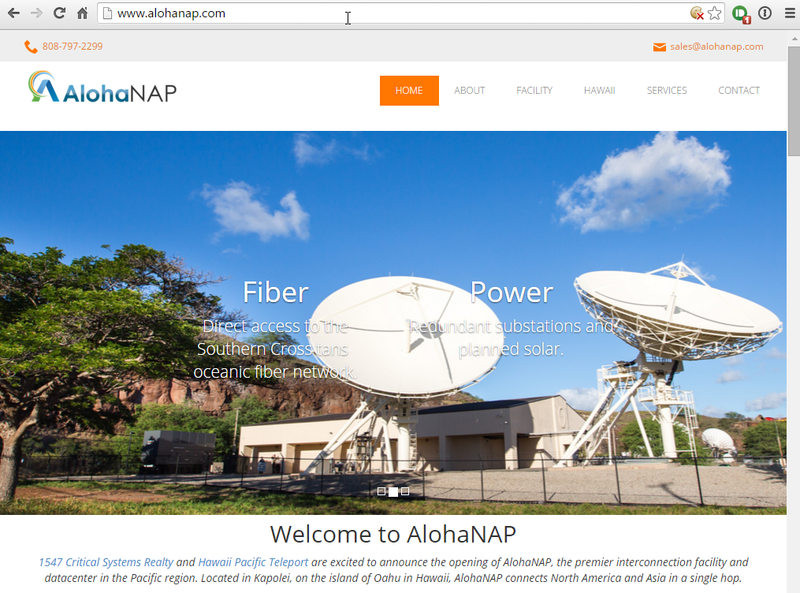 "Whether organizations are connecting to a public cloud based in the mainland United States or extending a hybrid cloud to servers hosted at AlohaNAP, Cloud Connect ensures critical data and applications are always online." The state of the art AlohaNAP data center in Kapolei opened in early 2015. The facility offers carrier-neutral connections to both global and local fiber providers, and satellite connectivity to over 40 different satellites. Qualcomm signed a strategic cooperation agreement with officials from the People’s Government of Guizhou Province and unveiled a joint venture – the Guizhou Huaxintong Semi-Conductor Technology Co., which will focus on the design, development and sale of advanced server chipset technology in China. The joint venture, with initial registered capital of RMB 1.85 billion (approx. 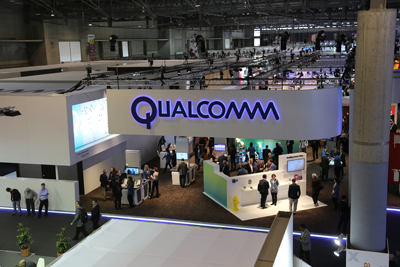 $280 million USD), will be 55 percent owned by the Guizhou provincial government’s investment arm and 45 percent owned by a subsidiary of Qualcomm. In addition, Qualcomm also will establish an investment company in Guizhou that will serve as a vehicle for future investments in China. The overarching agreement establishes a long-term commitment between the two parties to work closely together to identify and pursue business opportunities in the province. “This server technology joint venture is a win-win scenario for Qualcomm and our Guizhou partner and will yield mutual benefits for both sides as we together pursue a very large data center opportunity in China,” said Anand Chandrasekher, senior vice president and general manager, Qualcomm Datacenter Group, Qualcomm Technologies, Inc.